This fantastic vaniljekranse recipe from Sally Abé shows what a snip it is to whip up these delicious Danish Christmas biscuits. Tie the biscuits with some ribbon to make a brilliant edible gift. You know it’s getting close to Christmas when big blue tins of biscuits begin to appear on the supermarket shelves. 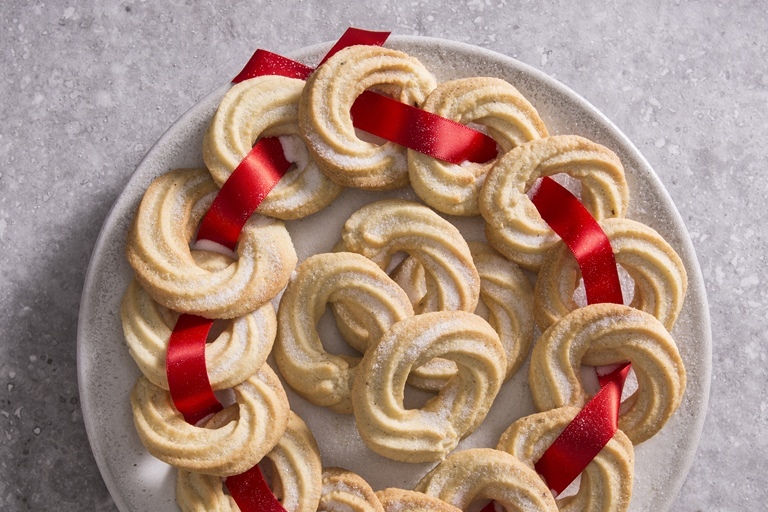 These little, mouthwateringly delicious little biscuits are more commonly known as Vaniljekranse in Denmark, which directly translates as vanilla wreaths. Making them at home is so quick and easy and easily outweighs anything you can buy in a store. If you don’t have a piping bag with a star nozzle you can roll the dough out to any shape you want but I think they look pretty like this. You can also tie some together with a ribbon to give to your loved ones as an edible Christmas gift. These Danish Christmas biscuits are delicious when fresh but will keep happily in an airtight container for a few days, although the chances are they won’t last that long!